Frontier Communications Co., formerly Navajo Communications Co., based in St. Michaels, Ariz., is celebrating 40 years of service to the Navajo Nation. Earlier this year, officials of Navajo Communications Co. - now part of Frontier Communications Systems - began saying "thank you" to the tens of thousands of reservation residents who have been their customers over the past 40 years. Hundreds came out as the company provided hot dogs and cake at its headquarters and branch offices. Joe Hausner, director of Navajo operations for Frontier, said the most emotional response to the company's anniversary celebration may have taken place in Crownpoint, where local schools made a field trip to the event. "As (the students) were getting back on their buses, they stopped and turned around, signing 'Happy Birthday' to us," Hausner said. Since NCC was formed, its been owned by several companies, including Great Southwest Telephone Co., CP National Corp. and Alltel, before being purchased by Frontier in 1995. The one consistency over the years, however, is that each of these companies invested millions of dollars - some $210 million since 1981 and $115 million just by Frontier - to expand operations and improve services. Early records indicate that the first telephone service on the Navajo Reservation began in 1928 when the Bureau of Indian Affairs set up lines from Flagstaff to Tuba City. Between 1932 and 1936, the BIA put in 1,500 miles of lines to connect boarding schools in Fort Defiance, Tuba City, Fort Wingate, Crownpoint, Chinle and Shiprock. Toll services were routed through border towns such as Farmington, Gallup and Flagstaff. NCC records indicate that very little expansion in services was made from 1937 to 1950. In 1950, the telephone system consisted of about 500 telephones in 13 exchanges (today, the company has some 30,000 customers). The BIA began divesting itself of the phone system in 1956 and the Navajo Nation became increasingly involved. In 1969, NCC was sold on behalf of the tribe to Great Southwest Telephone Co. and since then has been operated by private companies. 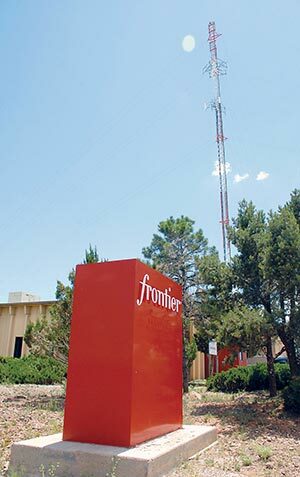 In 1995, it was purchased by Citizen's Communications and for the past five years, after Citizen's purchased Frontier, has operated under the Frontier logo but is still registered as Navajo Communications Co.
Over the years, the companies running NCC have seen good and bad years as they tried to bring telephone service to Navajo customers in Arizona, New Mexico and Utah. "We're doing fine right now," Hausner said. Service went first to the major growth areas and the company slowly began extending its lines to the smaller communities. Unlike telephone companies in more urbanized areas with several hundred to several thousand potential customers per square mile, NCC often was building power lines where there were only a few families per square mile, which increased expenses sharply. Each year, however, the company managed to expand into areas that up to then had never seen telephone service. In the 1980s, NCC also went into the cable television business, providing service to all major communities on the reservation. But this sideline ended when satellite services, like Direct TV and DISH, became available and NCC decided to get out of the business. The company offered to turn over its cable service to the Navajo Nation but the tribe also declined so it was shut down. NCC now has an arrangement with DISH that allows phone customers a $5 discount by including their DISH billing with their phone billing. Just as satellite companies were overtaking cable TV, NCC found itself facing another serious business challenge - cellular phones. In one way, NCC welcomed the new technology since it would allow tribal members in remote areas of the reservation - areas that would not get land lines for years, perhaps decades - to get phone service immediately. But today, said Hausner, the cellular phone companies are NCC's biggest competitors. Aware that many families can't afford cell phone service, which starts at over $50 a month, NCC offers Lifeline, which provides low-income families on the reservation with a big discount on landline service. Lifeline costs only $1 a month for those who qualify, compared with the basic $17 rate for a landline. "Right now, 50 percent of our customers are on the program," Hausner said. NCC doesn't bear the full brunt of the discount because it is reimbursed by a federal program for the cost of service to Lifeline customers. Another major challenge for the company in recent years is bringing faster Internet service to the Navajo Reservation, where most places still can only get an earlier generation of service, referred to as 56kbps, unless they go to satellite Internet. NCC is spending millions of dollars to bring high-speed lines, called broadband fiber optics, to as many communities as possible. "We've already brought fiber optics between Shiprock and Kayenta and we are now one-third of the way to Tuba City," Hausner said. Despite the formidable competition from satellite-based services, Hausner said NCC is constantly thinking of new ways it can better serve the Navajo population, and plans to be here for a long time to come.